Screams echo, distant memories etched in time, voices left behind by speakers long-dead…or are they something else? Man first stepped on the moon on July 20, 1969. We would only go a handful more times before keeping ourselves fully grounded on Earth. As with most great accomplishments, we tend to see the results as a much bigger thing than the work put in before. The guts, blood, sweat, and sacrifice. January 27, Launch Complex 34, Cape Canaveral. The crew of Apollo 1 were engaged in a test for the mission, not due to launch until February 21. In a tragic moment, something (and they really don’t know what) ignited inside the cabin. The craft was quickly and violently consumed in flame. Gus Grissom, Roger Chaffee, and Ed White were unable to escape, and died inside. 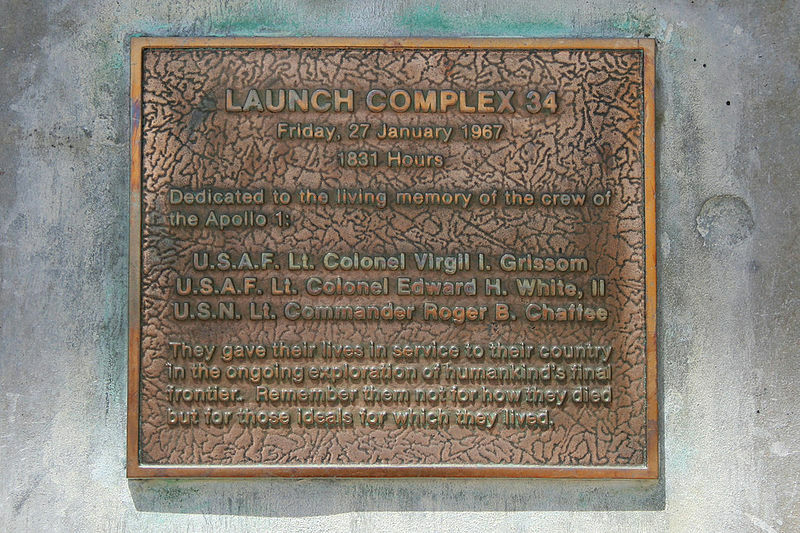 Launch Complex 34 was used until 1968 and then decommissioned. The plaque at the site. Today, you can visit LC-34 on one of the tours and see the part of the structure that’s still there. It serves as a memorial to the men who were lost as the human race pushed to stand on other worlds. Of course, because of the deaths, it’s not without its ghost stories. The stories are much the same as any other. Screams of the dying. Weird happenings, and the rumor that NASA closed it because of strange things going on, horrors too great for the general public. The last bit seems to be unfounded, and I couldn’t find any reason for it to have been closed other than the recent government shutdown. But suppose there are screams at Launch Complex 34, just not from the dying. Not echoes, but a real true sound with a mysterious source. A source as real as you and me, as physical as we are, but not something we can see so obviously. Like the Seneca Guns, there aren’t many answers. If we could find where the noises are coming from, look through a gap, imagine what we’d find there. Who we’d find there, staring back at us. What might be hiding at Launch Complex 34? Is the creaking of the floor a haunting by a mournful soul, or is our universe just something much more odd? With the exception of one of my early posts about the USS North Carolina, you may have noticed that this blog doesn’t cover hauntings very much. It’s not that North Carolina has a lack of spooky ghost stories; quite the opposite. You know all those “mysterious hitchhiking girl” stories? The ones where the guy takes her home, she’s suddenly gone, and he walks up to the door, only to find that she died ten years earlier? North Carolina has one, and the girl’s name is Lydia. We have plenty of ghost stories, but I am not one to believe that mysterious noises from abandoned homes mean that there are ghosts hanging around. My upbringing leads me to believe that the world, the universe, is a much stranger place than we can imagine, and that there are reasons for the weirdness that are much more complex than a ghost. Maybe there are other dimensions. Books have these, with the multiple worlds that brush against each other. Maybe there’s a wood somewhere, with little pools that lead other universes. C.S. Lewis wrote this version of a multiverse into his Narnia series. It could be that the universe as we understand it is not terribly understandable at all. Science is constantly being surprised. Imagination is the key to investigation into our universe. Calling this blog Weirdly Awesome has little to do with the paranormal and everything to do with how our world is full of secrets that are only secrets because we haven’t discovered them yet. I’m not interested in ghosts. I’m just interested in answers. I wrote awhile back about a local disappearance that occurred back in the 1880s. The case of James Abney is still mystifying to me, but here’s a look at the organization he founded, the DoorWay Society for World Connections. Like 99% of this blog’s content, it’s a little weird and hard for me to figure them out. Enjoy! Deep shadows, sticky water, and the sense you’re never alone will haunt you in the Great Dismal Swamp. Growing up in the typical American elementary school brought with both study and celebration of the origins of the United States as a nation. When I was a kid, back in the 90s, that meant memorizing the names of Christopher Columbus’ ships and wearing a paper grocery store bag at school on the day before Thanksgiving (or a black construction paper hat if you were supposed to be a Pilgrim.) Columbus didn’t even land on what we now know as the United States, and he certainly didn’t set out to discover a whole other continent. Yet on Monday, October 14, we’ll observe Columbus Day. It’s a wonder more children don’t grow up more interested in this continent and who might have gotten here first. It’s them that all the little kid history books tend to ignore, and you could just grow up tending to assume that the first people on the North American continent just sort of appeared here one day. Of course, it’s much much more interesting than that. What I find funny is the tendency to assume that people living in Europe, Africa, and Asia basically never went anywhere and ignored the rest of the planet, while North America remained serene and mostly unpopulated. We now know that at least the Norse were here, at some point, in Canada. That brings us back to the Great Dismal Swamp, and its role in a weird story about the possibility that Chinese explorers also set foot here, based on an old sighting of a junk, under the command of Zheng He, that might as well have been a ghost ship, buried in the mud off the coasts of North Carolina, and seen only a tiny handful of times. It’s elusive and the last time anyone recorded seeing it was some time in the 1920s. The Great Dismal Swamp isn’t the easiest waterway to navigate. You could imagine that someone could get lost. Or leave their boat behind. Possibly meet early Americans and establish a settlement in Appalachia. Maybe they met up with the Moon-eyed People? This isn’t to say that Gavin Menzies is a great historian or even right for that matter. A simple Google search doesn’t turn up much about this story. After all, there are much weirder and more accessible theories and legends about pre-Columbian American history that tend to overshadow the simple curiosity of other people we weren’t expecting to have been here. And knowing what we do about the history of this continent, like how much of the past has been lost, buried under other old things in our race to build a nation, makes us all to aware of how much we aren’t able to know. We can only see the shadows left behind, footsteps on the surface. We make up tales and imagine aliens and underground people to fill the quiet void of an empty continent. And without even a nod to all our stories, indifferent to the questions we ask, North America resolutely keeps its secrets buried in rock, clay, and mud. 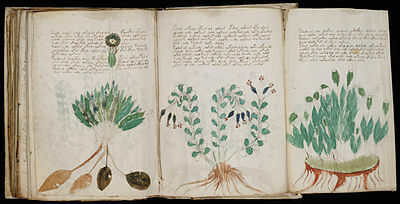 Possible codes, mysterious languages, and answers that elude us…we can’t get enough of the Voynich manuscript. It’s a pretty well-known artifact that’s been a frustration ever since Wilfred Voynich acquired it. That was back in 1912. It was probably written in the 1400s, and the pages are made of a pretty standard material, vellum, not paper. It’s handwritten, which is also not odd, considering its origin in time. What’s weird are the words we can’t read, labeling even stranger illustrations of patched-together plants, odd multi-armed swirls, and a map here and there. It would probably all make much more sense if we could just understand the words. People love a good code challenge, whether to set one or break it. The Enigma code machine played a role in World War II, the Zodiac killer’s last code is still undeciphered, and the Taman Shud case continues to frustrate. Codes are why the Voynich manuscript fascinates people. It’s an unanswered question, spread out over pages and pages, given illustrations that no one knows what to do with. The best part of the mystery is knowing that someone, at some point, might have known. Two friends, with one secret. A professional code between associates. Fun and games. An unknown dialect of a known language? A hoax, maybe. Fanfic, or a tie-in work to some other piece of fiction? All of these are possible, some definitely proposed. Especially the hoax. If it can’t be figured out, then it’s a hoax, right? Except for one key detail. Recently, as in 2013, two scientists, Marcelo Montemurro and Damien Zanette, found that the words appear in a pattern that would only occur in an actual language and would be absent in something completely made up. Suddenly, it’s entirely likely that the Voynich manuscript, strange illustrations and all, does mean something and has some context in which it can be understood. Trouble is, we don’t know what that might be. But isn’t it fun to imagine?